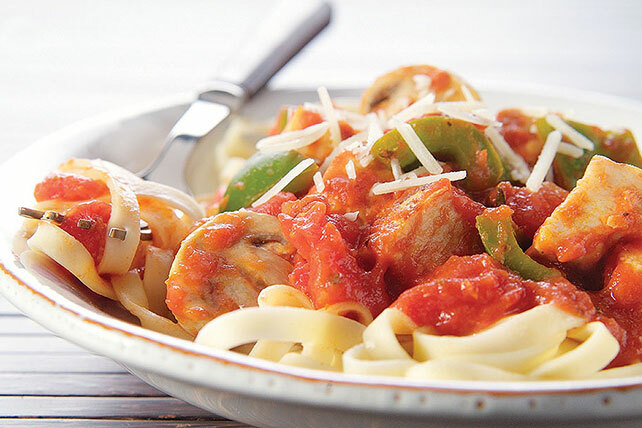 You could spend hours making a chicken cacciatore the old-fashioned way. Or make it the quick way—with ready-made sauce and pre-cooked chicken strips. Mix pasta sauce, peppers, onions and mushrooms in large skillet; cover. Cook on medium heat 10 min., stirring occasionally. Add chicken; cook, covered, 5 min. or until heated through, stirring occasionally. Spoon over hot pasta; sprinkle with the cheese. Prepare as directed, substituting 3 cups hot cooked rice for the linguine. Prepare as directed, substituting 2 Tbsp. KRAFT PARM PLUS! Garlic Herb Italian Topping for the Parmesan cheese.